I've been doing it so many years. 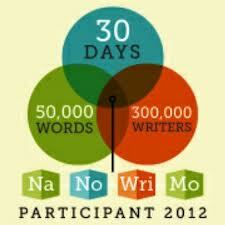 The NaNoWriMo, I mean. This wild, month long chase of a 50,000 word rough draft novel. I can't even tell you when I started. But this year, this year was going to be different. I swore I wasn't going to participate. I didn't have a real reason why except I was tired of the challenge, there were other things to do. A NaNo can be real disruptive to the household if it's not managed right and then there is always that feeling you get in your gut if you get behind. So I was out of it this year. For sure. No way. I signed up two weeks before the kick off, now so excited about the story that having to wait to start typing until today was a cruel fate. I read No Plot, No Problem - twice. Read Ready, Set, Novel but opted not to use it; and I got my handy dandy NaNo kit with everything inside to keep me going. And I bought the purse. Um huh, You read that right. Every year I buy a purse that I really like and I have it shipped to me. Then I sit the box where I can see it from my work station. If I pass the 50,000 word mark on time, I get to keep the purse. If not, I have to give it away. In my opinion the NaNo is a lot like this. It's a month long game with yourself to see how far you can push to get the words out. Some days they come easy, flowing onto the page like a gift. Other days it's like wrestling live chickens with too much noise and a mess all around. Happily you can find yourself somewhere in the middle. Little treats help. Little surprises. "If I just get five hundred more words done I can have that latte from Starbucks." Add a thousand to that and toss in a scone. The NaNo is hard. Very hard. But as I have come to learn it's ingrained in my brain. It's fall. The Halloween decorations are up and it's time for me to start typing.